It’s that time of year again, and this year going back to school presents us with a one-time opportunity that we will not see again until our oldest son Will is a senior in high school. 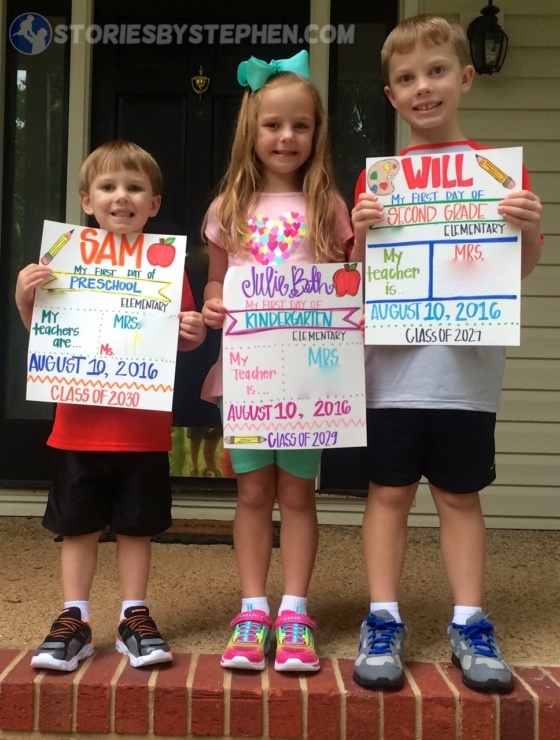 For one year only, all 3 kids are in the same school together. In 10 years during Will’s senior year, Sam will be a freshman. The only reason we got the opportunity this year is because Sam got into the Pre-K program (for 4-year-olds) at the elementary school. Julie Beth was in the Pre-K last year, and we really love the program. Last year the Pre-K program, which is full-day, was brand new, and there were exactly 36 kids who signed up for the 36 spots. This year word got around town, and about 80 kids signed up for the 36 spots, which were chosen by a live lottery drawing. Jennifer and I attended the lottery, and all of us who had our children’s names drawn were extremely excited, while we also watched dozens of sad faces leaving that day. 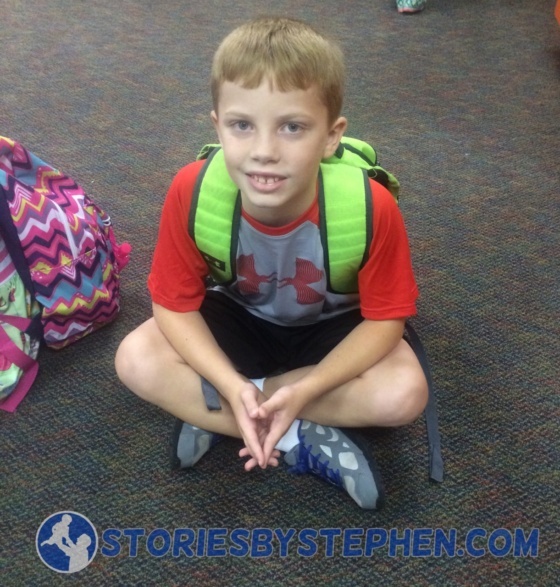 *Click here to see my back to school post from last year. I could be wrong, but I think we are the only family with 3 kids at the elementary school this year. Our school system has 2 elementary schools, one for Pre-K through 2nd grade and one for 3rd through 5th grades. The situation really could not have worked out any better for us. Sam is extremely shy. Jennifer and I are both introverted, and I think Sam got a double dose of introversion. He never stops talking at home, but he does not speak at church or school. 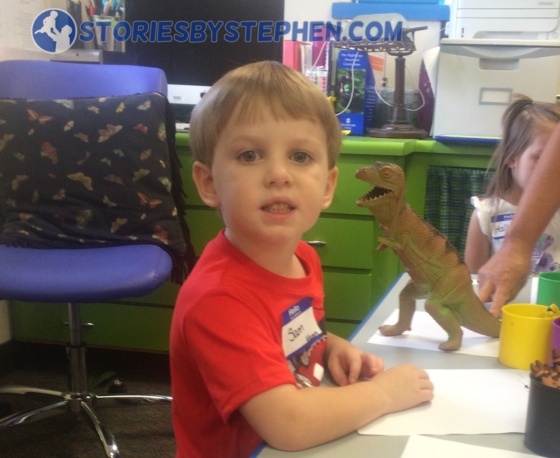 He loves his Sunday school class and teachers, and he loved his preschool last year. He tells me all about it on the way home, but all his different teachers say that he rarely, if ever, speaks a word to them. One of the reasons we are so excited about how things worked out this year is because Sam got into the same Pre-K class that Julie Beth was in last year, so Sam and both teachers already know each other. Sam and I went into that classroom lots of times last year for school parties, and they saw Sam in my car every single day at pick-up last year. For an extreme introvert like Sam, this is about the best way it could have happened. We are keeping our fingers crossed that he will come out of his shell a little bit this year. It should also help that he will see his older brother and sister at school. 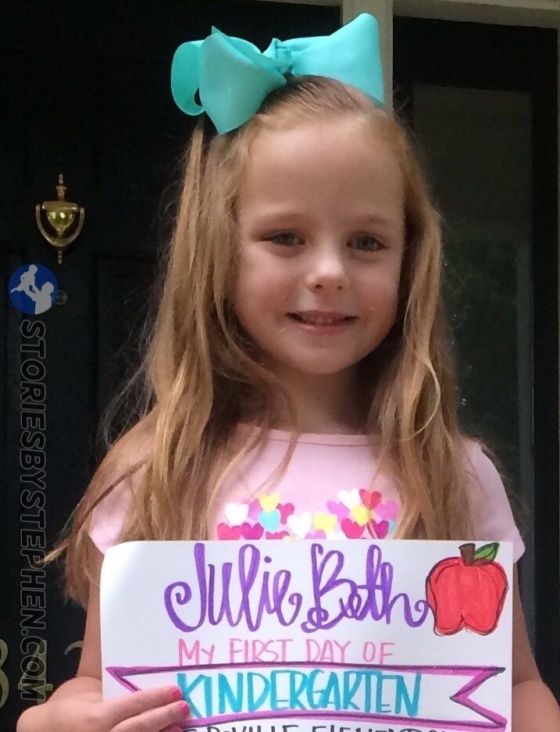 Julie Beth got a teacher that we know from church, and we are really excited about kindergarten. Since she was in the Pre-K program last year, the 1st day of kindergarten is not the radical change that you would normally expect. For Julie Beth, she is just going back to her school, rather than starting at a brand new school. Will is going to really be challenged this year. His teacher is known to really push her students, and she previously taught the program for gifted students. Now she teaches a standard 2nd grade class, but she receives many of the kids who really excelled in 1st grade. 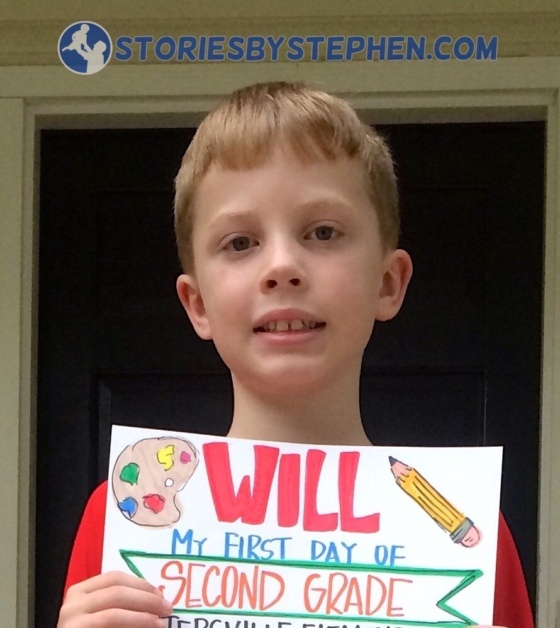 Will was very far ahead in reading and math last year, so he was recommended for this 2nd grade class. We are excited because we want him to keep excelling and not get bored with school. 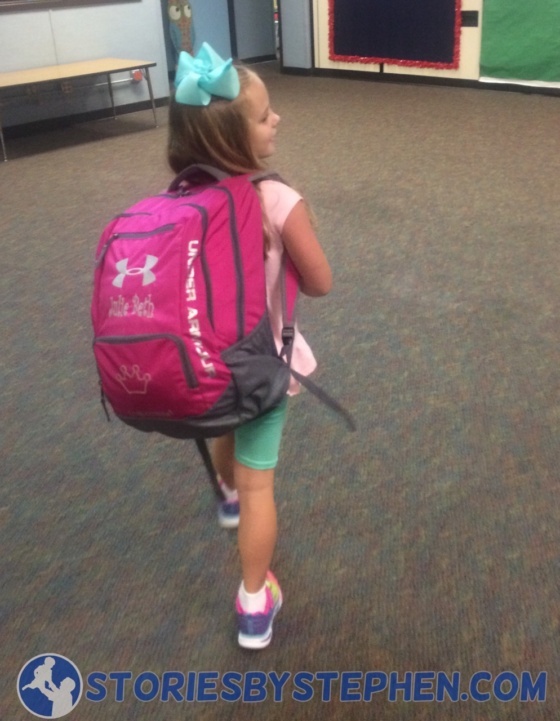 At her orientation meeting a few days ago, she expressed her high expectations for the students in her class, and Will instantly knew that 2nd grade was going to be much different from 1st grade. Of all the things Will does well, one thing that really makes me proud is that he has already developed a love for learning. He seems to understand the importance of continuing to learn new things, and I hope that he always seeks to be a lifelong learner. Everyone got new lunch bags this year. Because he has an older brother, Sam has already gotten into super heroes. 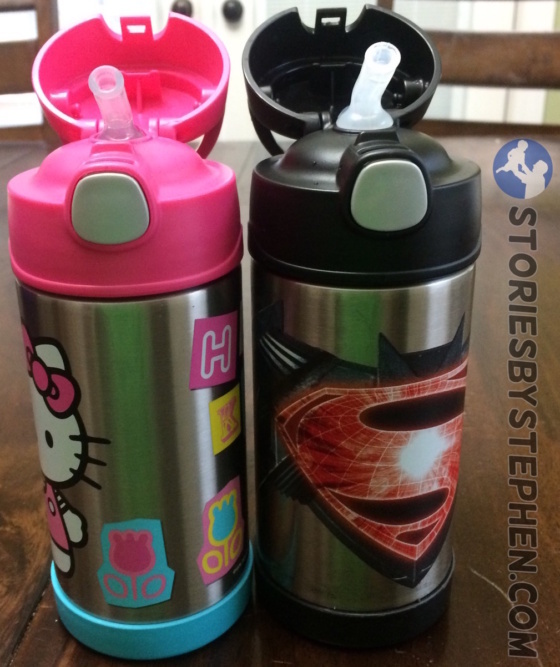 He especially loves Batman, Superman and The Flash, so he got a Justice League lunch bag. 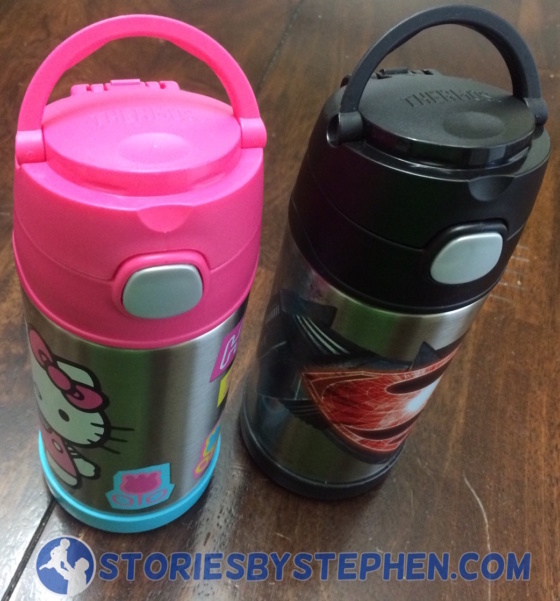 Sam and Julie Beth got these new Thermos Funtainer insulated water bottles, which they love. 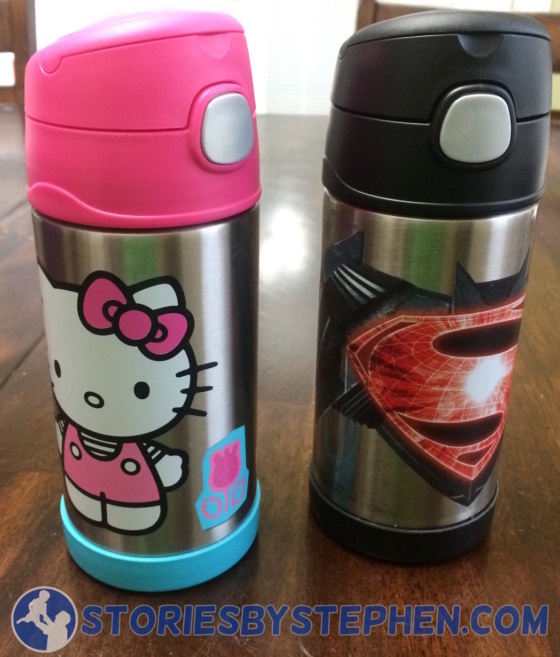 The school recommended these specific water bottles because of the flip tops. 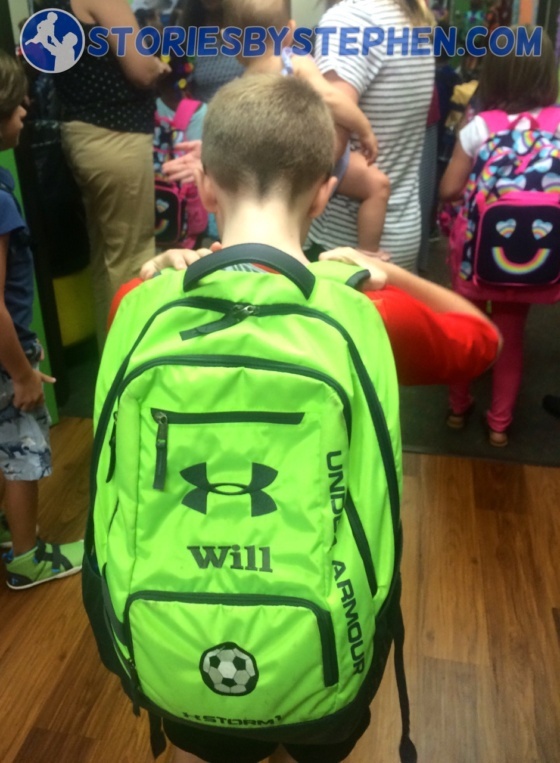 Will and Julie beth already had their bright Under Armour backpacks last year, and Sam was very excited to get one in bright orange, his favorite color. Sam NEVER smiles for pictures. He is more likely to intentionally turn away from the camera than to smile, but we knew he was excited about school this year because he kept smiling for pictures! 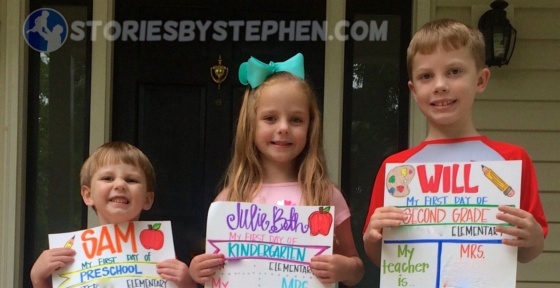 All 3 kids excitedly hold their “First Day of School” signs. 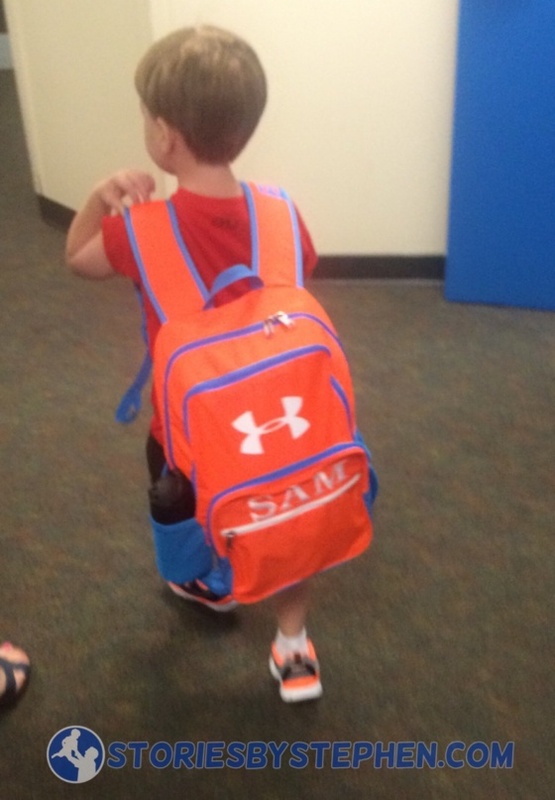 Sam’s new backpack is still a little big for him! It was especially heavy on day 1, loaded down with his nap mat, pillow, etc. Will heads into school for his 1st day in 2nd grade! Julie Beth walks into the kindergarten common area. Sam lugs his backpack around school on day 1. Will sits in line with his new 2nd grade class. 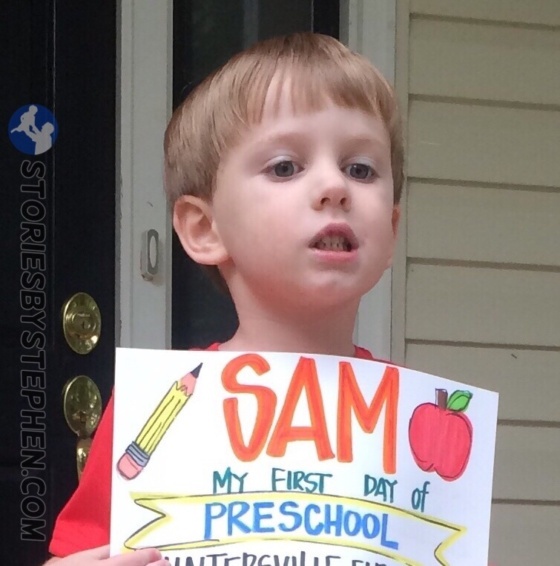 Sam sits at his Pre-K table. He smiles, unaware that a dinosaur is about to bite his ear! 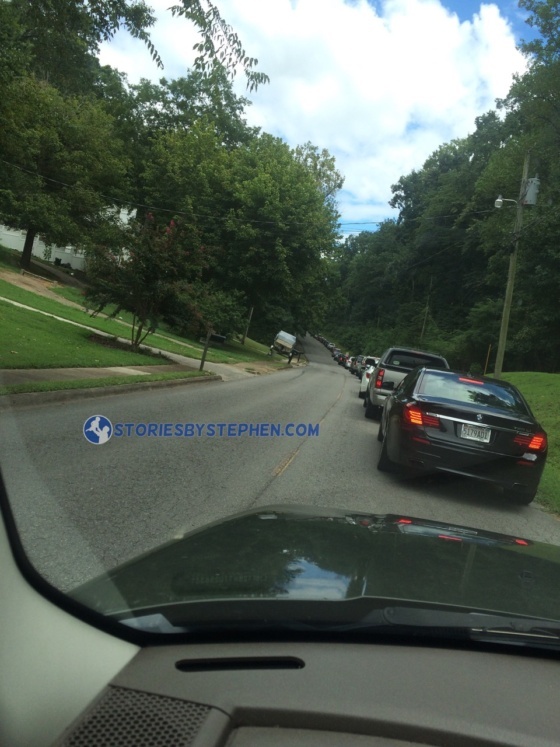 I waited in this never-ending line for 30 minutes to pick-up Will on the 1st day of school. Luckily the Pre-K pick-up area is in a different parking lot, and that line is only a few cars long. After next week I will be able to pick up all 3 kids in the much faster Pre-K line! I am looking forward to seeing how the 2016-2017 school year goes, and if you have kids in school, I hope you have a great school year too!